In the game of basketball, it's not so much the number of points a great scorer accumulates, but rather when he scores the points. Held scoreless over the first 24 minutes of Friday night's Conference USA quarterfinal game with Tulane at FedExForum, the Memphis Tigers' Tyreke Evans scored 12 consecutive points midway through the second half to turn a 32-28 deficit into a 40-32 lead that his fourth-ranked team would not relinquish. In winning 51-41, Memphis extended its winning streak to 23 games (third-longest in school history) and its record-shattering streak in C-USA play to 59 games. Critical in the victory over the tourney's ninth seed was a 12-minute stretch of the second half in which Memphis held the Green Wave scoreless. "I'm glad we're a good defensive team," said Memphis coach John Calipari after the game. "Because this was a loss waiting to happen. These kids are not machines; they're not computers." 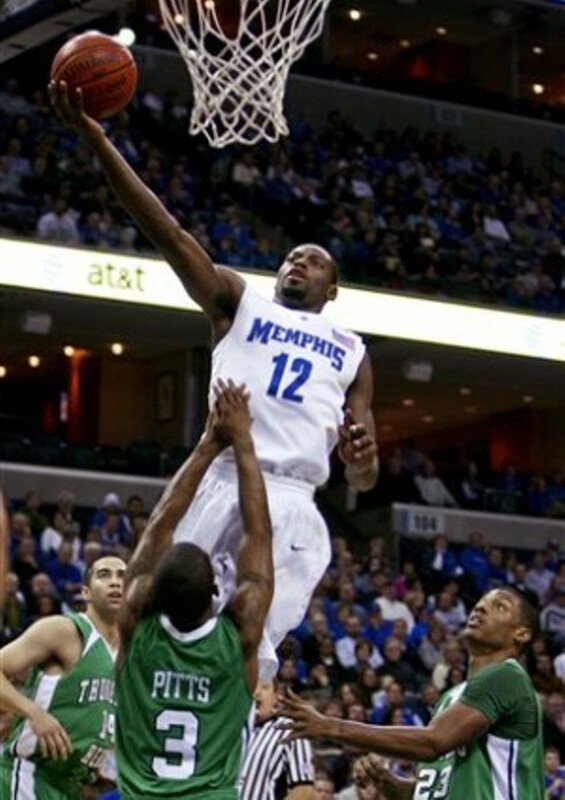 The Tigers held Tulane to 29 percent shooting for the game and forced 13 turnovers. "We're one of the best defensive teams in the country," added junior center Shawn Taggart. "If we don't 'D' up, we're gonna lose." 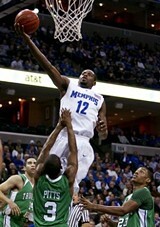 Taggart carried Memphis in the first half with 15 of its 26 points and led the Tigers for the game with 19. The Tigers' offense, on the other hand, was as cold as the near-freezing temperature outside the arena. They attempted 13 three-pointers and converted exactly one (by Doneal Mack). Seniors Robert Dozier and Antonio Anderson -- who each tied an NCAA record with their 133rd career victory -- combined to score four points. "We didn't bring it," said Calipari. "I just told them after the game, if that's what we are -- right there -- it's been a heckuva ride. Hopefully, they'll understand. What I think is that, when it's time to step up, this team will. This was ugly; it didn't look like us. Tulane knew they could play us; they played us good last time. If you play flat this time of year, a hot team will beat you." Calipari discounted the notion of any winning streaks adding pressure to his squad. "Every game has its own importance," he stressed. "We prepare for every game about the same way. Our whole season is played for a seed. This tournament is about our seeding in the NCAA tournament. I really think this team has a chance at winning a national title. In this city, every game when the ball is thrown up, we're expected to win. At the end of the day, they're not computers. Every team has three or four bad games; let's hope this was one of our bad ones." Memphis next plays the winner of Friday night's UTEP-Houston game in a semifinal scheduled for tip-off Friday afternoon at 3:00. The other semifinal will be second-seed Tulsa against third-seed UAB.